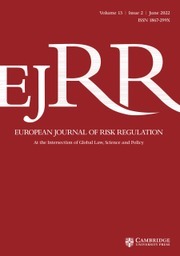 European Journal of Risk Regulation is a leading peer-reviewed interdisciplinary journal published quarterly, connecting scholars and practitioners since 2009. How are risks to citizens’ health, safety, privacy and the environment regulated across policy domains globally? Which regulatory responses to offer in times of uncertainty and societal contestation? As the pace of change accelerates, and as risk interconnections deepen, the journal explores classic and emerging risk phenomena, ranging from new technologies, environmental degradation, pharmaceuticals, food and other consumer products, to financial regulation, natural disasters and terrorism. It features research articles, current developments and reports, analyses of decisions by national and international courts and book reviews by pre-eminent scholars and practitioners from around the world. EJRR is addressed at academics, professionals, policy-makers and all those involved or interested in the global risk landscape.